The Art of Leadership, 5th edition is based on two ideas. Leadership will take place to the extent the leader cares about the work to be done. Equally important, the leader must care about people. Neither of these qualities is sufficient without the other, and neither can be false. People know when the leader cares. When the leader is committed to the task and is concerned about people, these qualities serve as magnets and motivators to followers, and their potential for achievement becomes enormous. Leadership is an art that can be developed through mastery of nine key areas of success. The successful leader must possess knowledge and skills in the following areas: understanding leadership variables, the power of vision, the importance of ethics, the empowerment of people, leadership principles, understanding people, multiplying effectiveness, developing others, and performance management. The difference between most other leadership texts and The Art of Leadership, 5th edition can be compared to the difference between a lecture and a seminar. Although both are good educational vehicles, the lecture is better for conveying large amounts of information, while the seminar is better for developing skills and attitudes. A good lecture is interesting and builds knowledge, while a good seminar is stimulating and builds competency. Without sacrificing either theoretical foundation or important content, the fifth edition of The Art of Leadership emphasizes the interactive, seminar approach to learning. Lots of content to take in and the class I'm using it for is a 3 week class that meets twice a week. Intense! 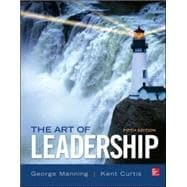 The Art of Leadership: 5 out of 5 stars based on 1 user reviews.